A record number of competitive award nominations have been received for the prestigious 2018 Plumbing and Fire Industry Awards (PFIA). 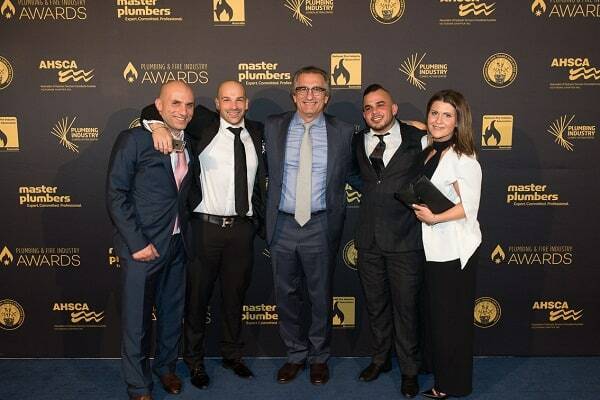 Each year, these awards shed a bright light on the achievements of individuals and companies within the Victorian plumbing and fire protection industries. Members of the public, employees and employers were strongly encouraged to put forward award nomination submissions for the sixteen award categories. The Drain Man and Cooke and Dowsett submitted nominations for the Excellence in Sustainability Award. This award is presented to a company or individual who has delivered innovations, solutions or new technologies to improve energy efficiency or the sustainable use of water. Strong nominations were submitted for the Excellence in Education and Training Award, which is presented to a Plumbing or Fire Protection industry professional who has improved the delivery of education and training services to the industry. Congratulations to finalists Gavin Hunter (Fire Industry Training), Warren James (RMIT) and Wayne Diffey (Master Plumbers). The Tradelink Women in Plumbing Rose Curtis Award is presented to a female professional or apprentice who has excelled in her trade within the plumbing, fire protection or HVAC industries. Congratulations to Breanna Szitarity and Victoria Tomkins who are both finalists for this award. The annual Plumbing and Fire Industry Awards will take place Saturday 1 September 2018 at The Sofitel Melbourne on Collins. Representatives will attend the event from a range of companies in the plumbing and fire protection industries. The event is expected to have over 530 guests. Good luck to all award finalists.